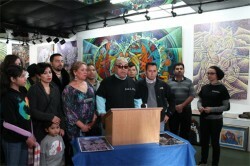 Community activist Raul Montes, Jr., and Director of Meztizarte Jose Luis Piña held a press conference this past week for Open Studios Festival on 18th street in Pilsen to “allow the public a glimpse at the diversity in Pilsen when it comes to international art,” said Montes, Jr. “All artists involved in the festival either work or live in Pilsen or have a connection in Pilsen. It is one of Chicago’s most artistic and culturally vibrant events in Pilsen,” said Piña. The event was at Casa De La Cultural Carlos Cortez Meztizarte.